A perfect storm is brewing. Fiscal austerity, demographic change and other pressures will mean that business as usual for our public services will no longer be enough. Innovative responses will be required. 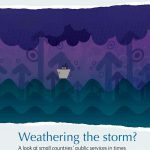 In Wales the pressures facing the rest of the UK are likely to be a more intense storm: poverty is greater and the proportion of over 65s will be higher. How are other small governments in Scotland, Quebec, New Zealand, Denmark, Austria and the Netherlands responding to these challenges? Can Wales learn from the approaches being taken in these countries? Click on the image to download the full report or download the English and Welsh summaries below. Produced in partnership with Wales Public Services 2025.